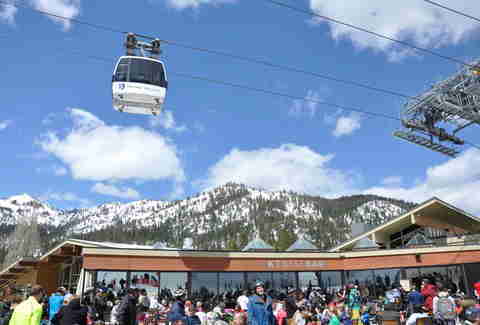 It's hard not to love Spring in Squaw Valley... and not because you can basically ski in a t-shirt, or because the gear is all 50% off, or because that's when the mid-mountain hot tub bar opens, or because it's basically the best time of year to après-ski your face off. 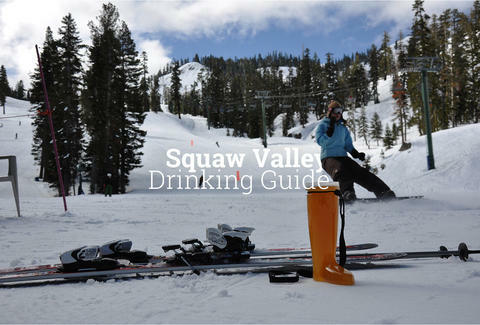 Actually wait, no, those are EXACTLY the reasons to love Spring in Squaw. 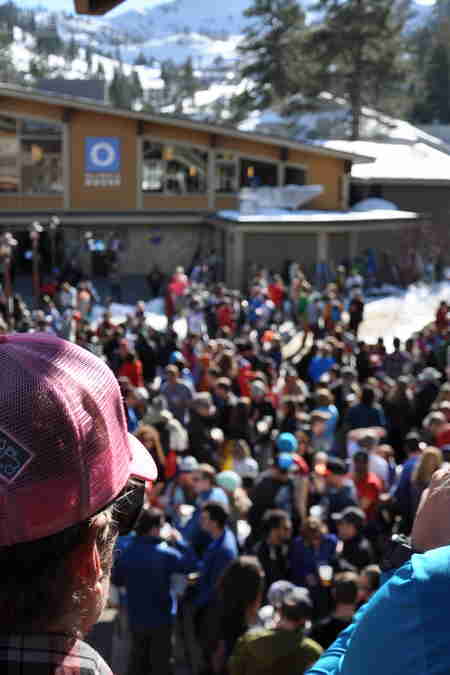 With less than a month to go before they start stowing away the shotskis, here's your definitive guide to drinking in Squaw, from clandestine on-mountain beer gardens, to one of the top 100 PBR-selling bars in the entire country. This is the coldest beer you can get in California. It's served on a bed of snow. 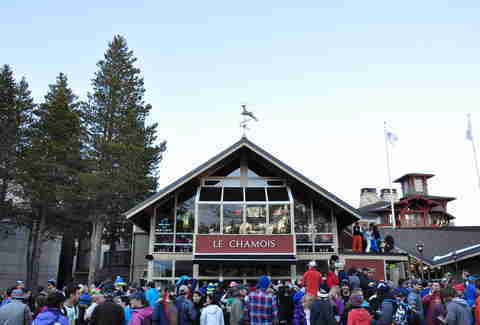 First stop: Le Chamois. 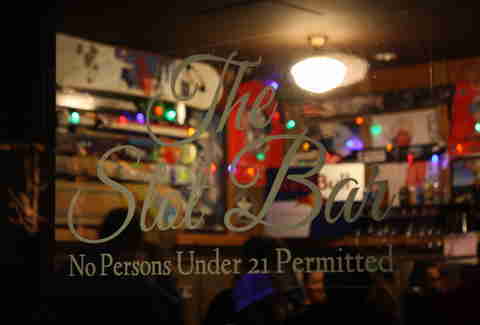 Half-loft bar, half-drinking lawn, The Chammy is tucked down an alley on the far West side of The Village, and filled with all kinds of skiing fraternity awesomeness (old lift chairs, framed jerseys, even a sometimes-operational miniature tram above the bar). Despite the fact that it's only open six months a year and basically closes when the sun ducks behind the mountain at 8pm, The Chammy is still the No. 2 Budweiser seller in all of Northern California, second only to the 17,000-person holding Arco Arena. ... slide open the window around the corner, climb out on the roof, and your view will look something like this. 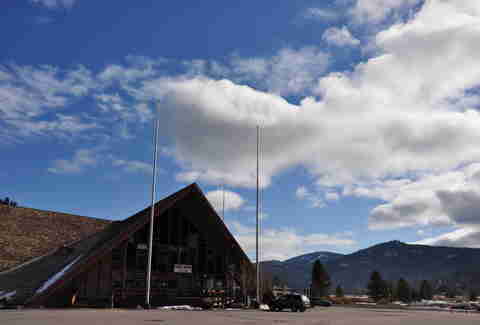 Or, brave the massive crowd out front and your view will look something like... this. Just around the riverbeeeeend... err... um, corner from The Chammy, you'll run into KT Base Bar. Things to know about the bar: 1) it's basically a giant boozing patio, 2) it faces KT peak (and the consensus No. 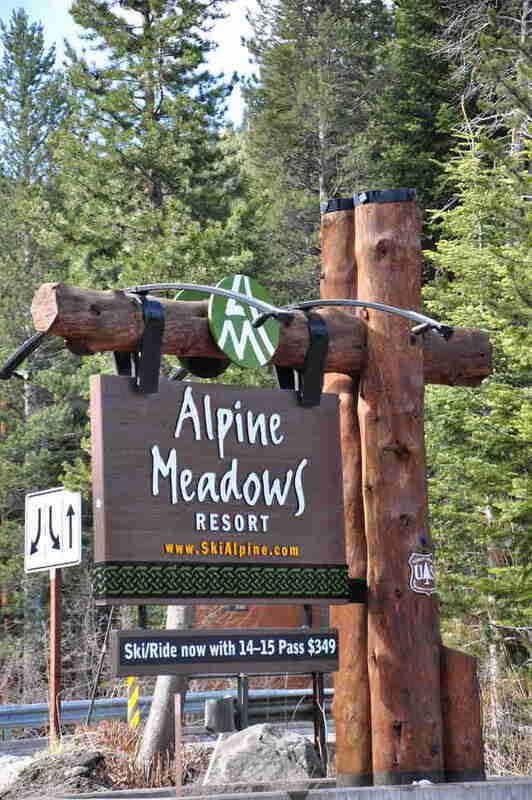 1 chair lift in the country), 3) there's a little 10-stool bar inside by the locker room if you're allergic to giant boozing patios, and 4) their funitel ski lift goes awesomely right over the patio. Get the Bloody Mary. Yes, even if you're not hungover. 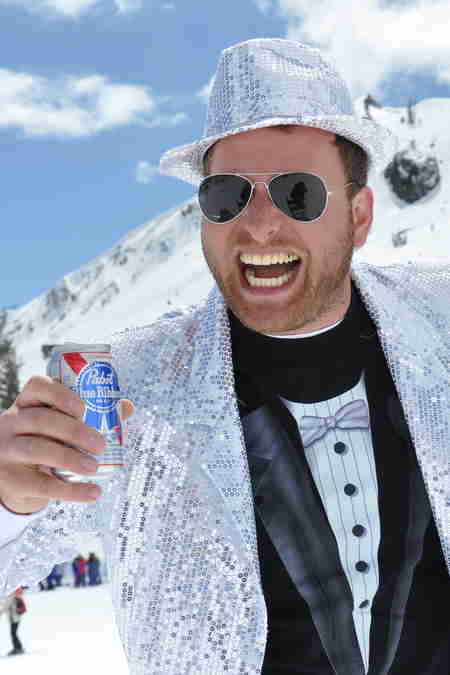 Because you're probably gonna be skiing at some point, you're gonna need some sitting-around-the-hot-tub-after-skiing beers. You can get a $30 sixer at one of the bars in The Village, or you can not be an idiot, and go to Alice's, where you can get a sixer of 16oz Olympia pounders for $10. 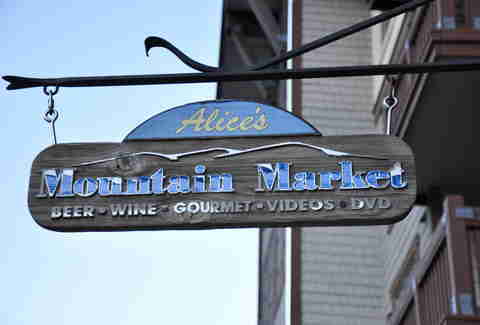 Also important: they have a selection of on-mountain pick-me-ups you can stuff into your Patagonia vest. And an entire wall of critically-acclaimed, definitely award-winning DVDs. Ah, Mamasake. 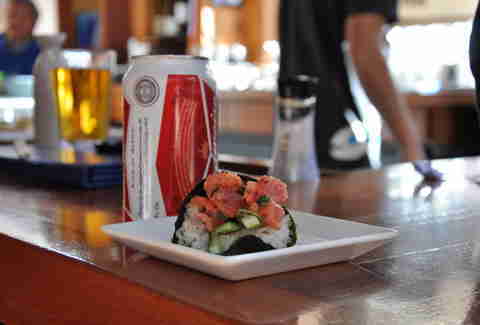 Home to the annual wasabi-eating contest and the $5 Happy Hour Beer and a Hand Roll. From 3-5pm, you can get any of three different rolls (or "Mama's Balls"... ? ), and either a Bud or a Bud Light. Just like in Japan. That thing out in The Village parking lot? Yeah, it's a bar too. 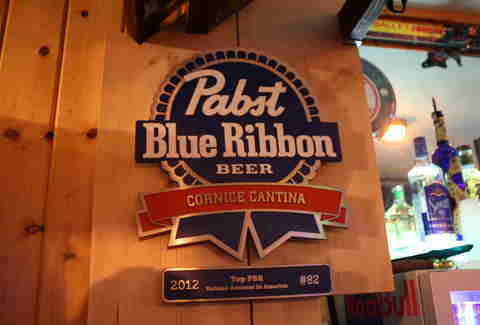 It's Cornice Cantina, though it was originally the Olympic tuning and waxing center during the 1960 Games, before being turned into a movie theater, and now one of the Top 100 PBR sellers in the entire country. You're gonna want to skip the margs entirely (don't let the Mexican theme fool you! 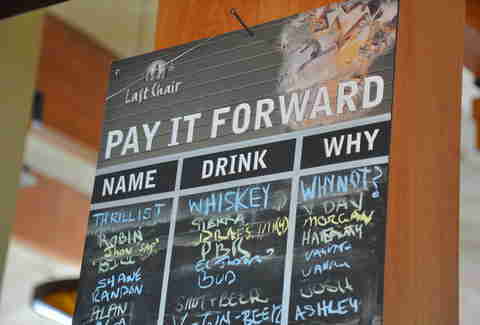 ), and ask for a "Shifter" -- it's a one-time-per-night PBR they give you for $1 if you're coming off your shift/say sorta convincingly you're coming off your shift. The Slot. Where to start. The Slot is a 300sqft bar with no bathrooms or even a storage closet -- which is because it used to be an employee locker room for a next-door restaurant. 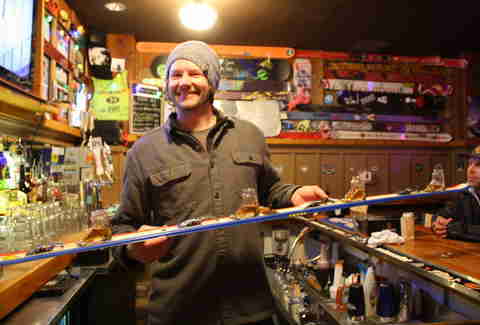 This is a pretty special place: 1990s ski videos play on loop on the TV behind the bar, famous skis adorn the walls and ceiling, and there's a bar dog that does laps around The Village and ducks back behind the bar for treats. 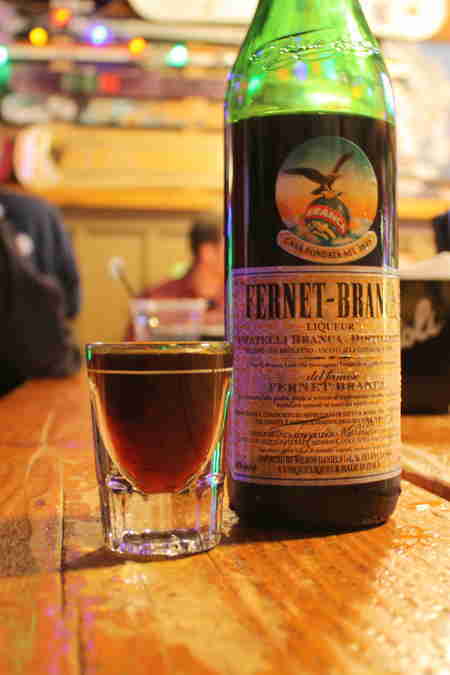 Like any good 3ish-hours-from-San Francisco bar, they have Fernet. 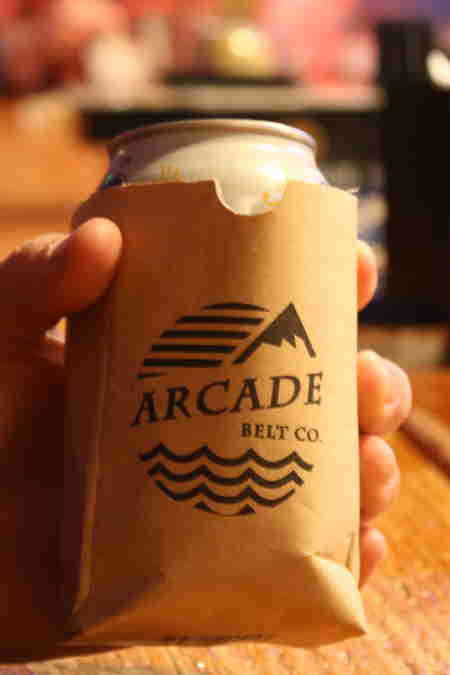 And like any good free-stuff-giving bar, they'll hook you up with this koozy from Arcade Belt Co. for your beer can. The real magic, though, comes courtesy of Fritz. 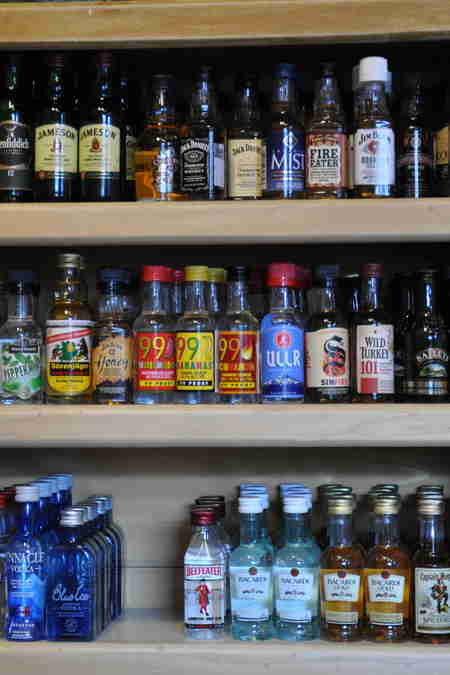 One of just three bartenders (they had a fourth who just moved to Alaska to work for a Heliski operation), Fritz will play an awesome bar game with you: order a Mickey's grenade, figure out what the picture puzzle under the cap means, and he'll fill your cap with a free shot of Jaeger. Oh also: Fritz has a shotski with glass boot shot glasses that click in. Yup. 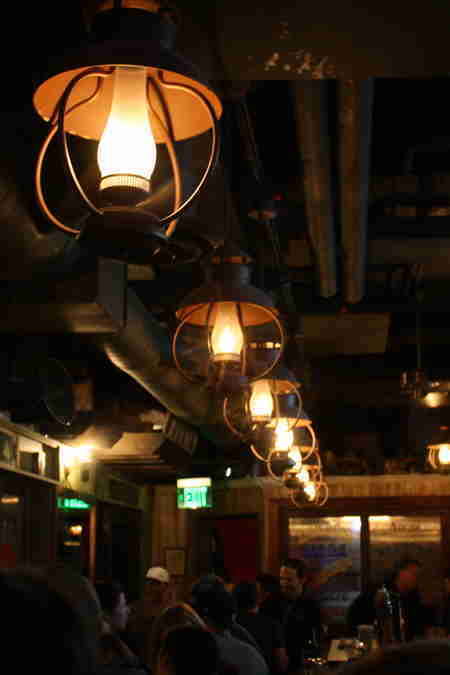 The Dubliner is kind of like The Slot, in that it's where you'll probably find yourself at the end of the night. 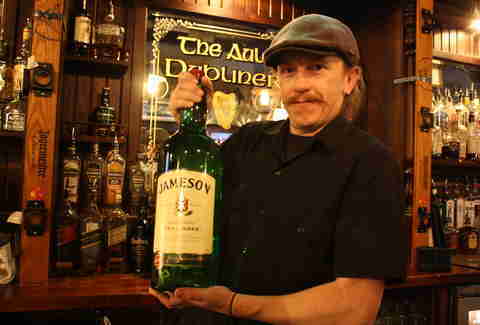 Not only is this the only Irish bar in all of not-South-Lake-Tahoe, it's also a ridiculously legit one with a crazy-good Irish whiskey selection overseen by Randy, who'll pour you three shots at a time in Jameson bottle-shaped serving trays. God bless you Randy. And God bless 1) the actual Irishman who opened this place, and 2) every single piece of decor in the bar, all of which was shipped over in a container from Ireland. 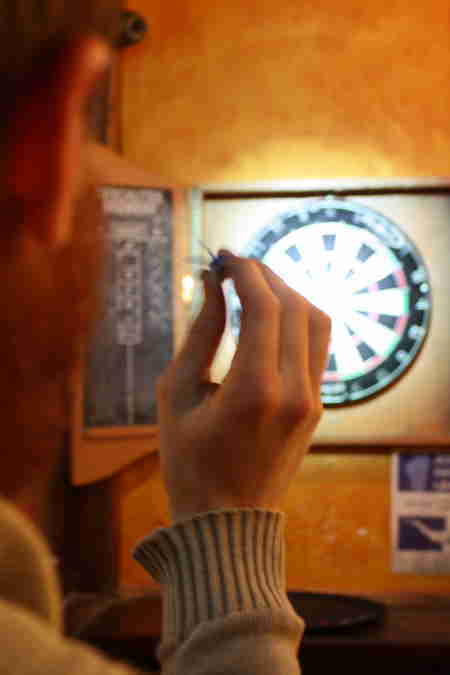 Also: darts! Also, also: live music! Also, also, also: they have a Jameson snowboard!!! 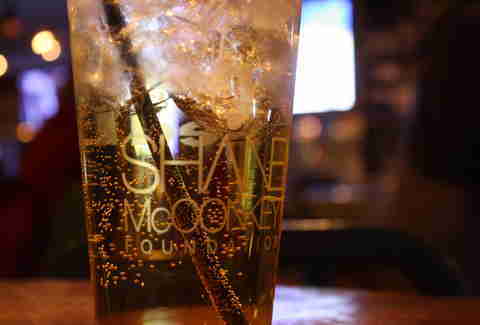 ... but so is this drink: The Shane McConkey (aka a vodka-Red Bull). When you order it (and you should), not only do you get to feel warm and fuzzy inside because all the money goes back to a foundation in his name, but you get to keep the glass. What, you thought we were only gonna be drinking in The Village? 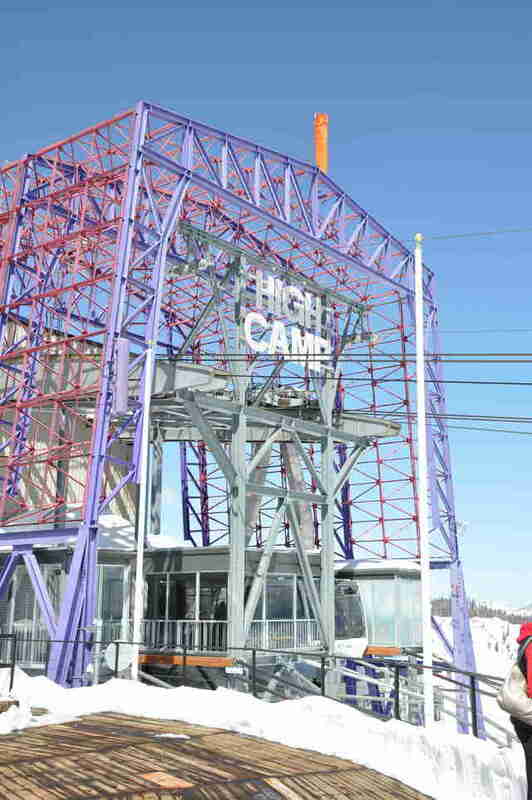 This is High Camp, 8,200ft above sea-level, and an entire tram ride up the mountain. 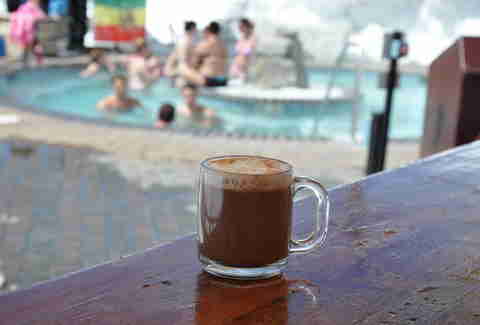 Once you get there, you're gonna want to head here: The Umbrella Bar, a hot tub bar (A HOT TUB BAR!!!) that'll pour you a "Stabbin' Cabin" w/ Sailor Jerry, Amaretto, Irish cream, hot choco, and whipped cream. Two things are almost guaranteed to happen while you're here: 1) someone will dare someone to do snow angels in the bank of snow that surrounds the hot tub, and 2) you will travel back in time to 1986. 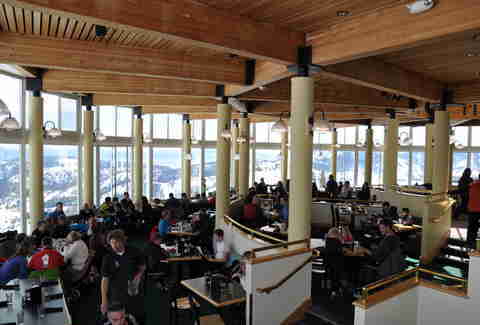 Even though the view is clearly terrible, you should maybe also pop into The Terrace a hallway away. 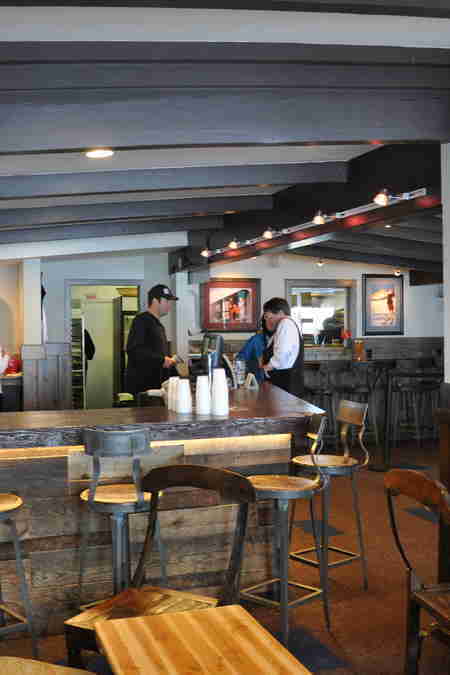 The bar here is actually sunken, so the tender doesn't block the mountain backdrop. 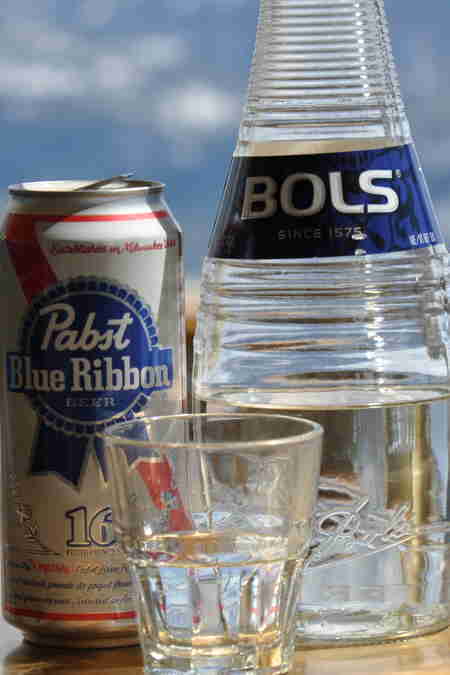 ... the all-time-greatly-named Peebermint (peppermint schnapps + a PBR). ... and this guy. He's mid-360 here. 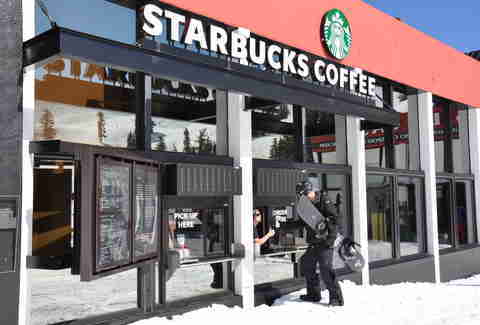 Located next door to The Arc, this may not be a bar, but it IS the only ski-in, ski-out Starbucks in the world. Also if you loaded up at Alice's, it's got the other half of your Irish coffee. 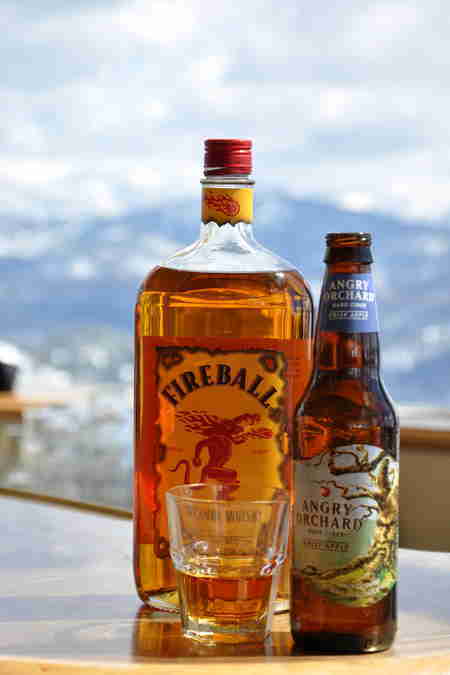 What, you didn't think we were only going to be drinking in The Village and at High Camp, did you??? 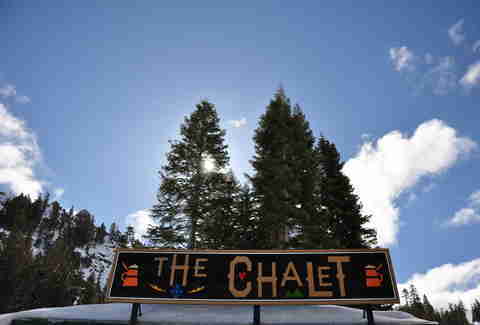 The German crown jewel of Alpine Meadows, The Chalet is a Bavarian beer garden in the middle of the mountain that YOU CAN ONLY REACH IF YOU SKI THERE (... OR ARE REALLY GOOD FRIENDS WITH JEFF, WHO WORKS AT SKI PATROL AND HAS A SNOW MOBILE). 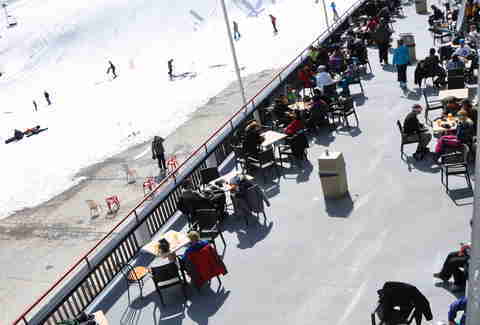 Outside, they've got communal tables for beer drinking, plus slope-facing lawn chairs. 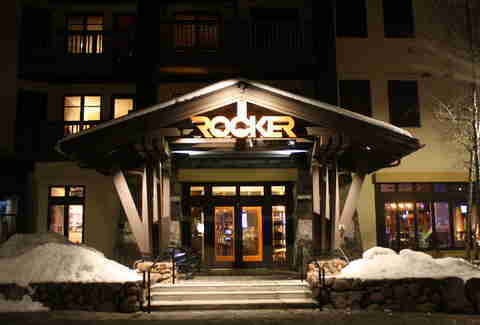 Inside, it's all blond woods, Lederhosen tees, working fireplaces, and Austrian brats. 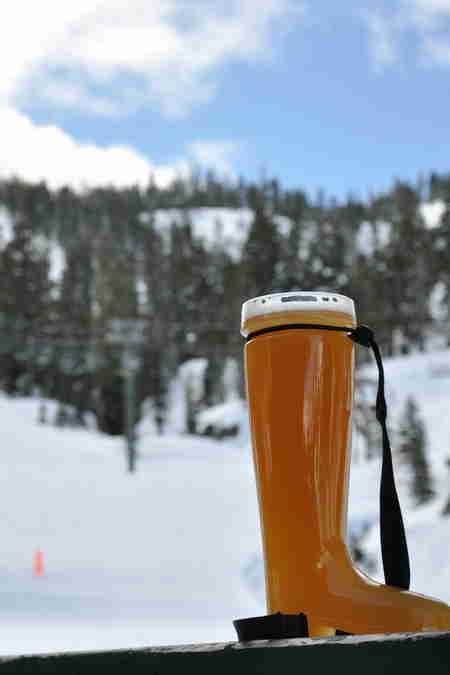 You're gonna order any of four Sierra Nevadas (that's all they serve), and you're gonna order it in a 34oz Das Boot, which has a lanyard so you can wear it while skiing. 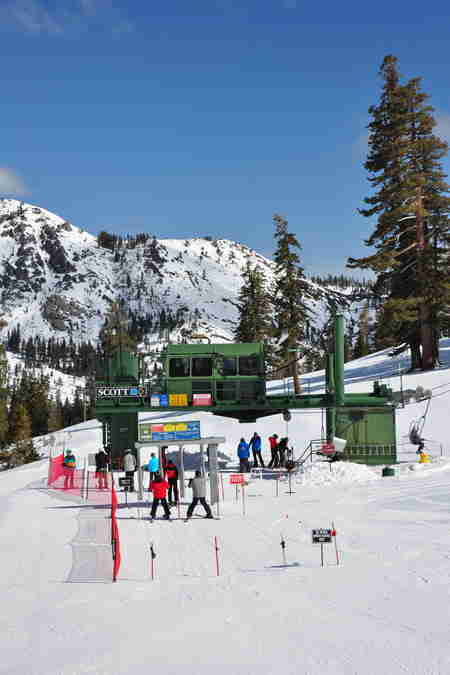 Best of all, the Scott lift is right behind The Chalet, so you can put back a $20 boot, ski down a black diamond run ('natch), and refill it for only $11! 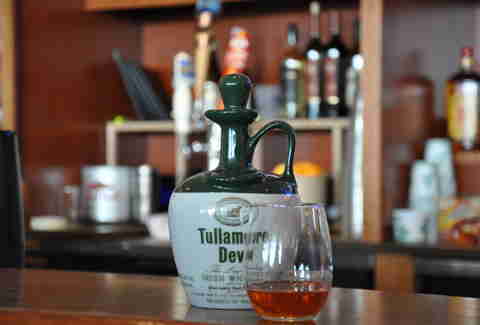 ... he'll get that shot of Tullamore Dew from the ceramic jug fo' free. 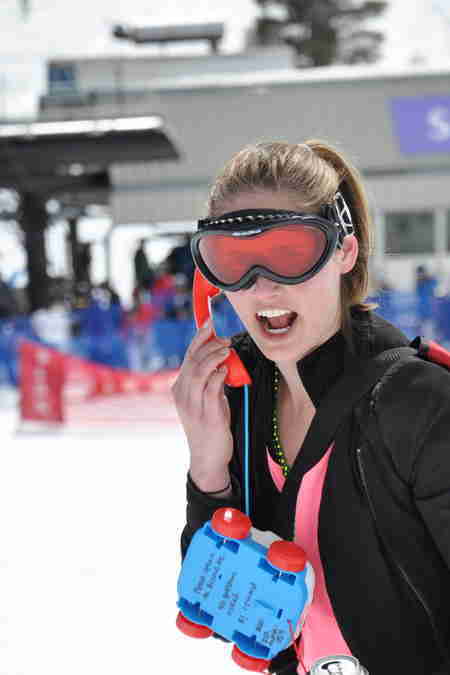 Grant Marek is a Senior Editor at Thrillist and did at least two shotskis during the making of this drinking guide. Follow him on Twitter at @grant_marek.